The cornerstone of Gulley Hall was laid on May 28, 1908. Back then, UConn was known as the Connecticut Agricultural College, and Gulley Hall had a different name too— Horticultural Hall. A brick building in the colonial style, it was built at a cost of $55,000 during the presidency of Charles Lewis Beach. The building was designed to support the school’s work in horticulture. The basement had a large room to demonstrate and house spray apparatuses for garden cultivation, as well as rooms to prepare produce for market and cool rooms to store fruits and vegetables. 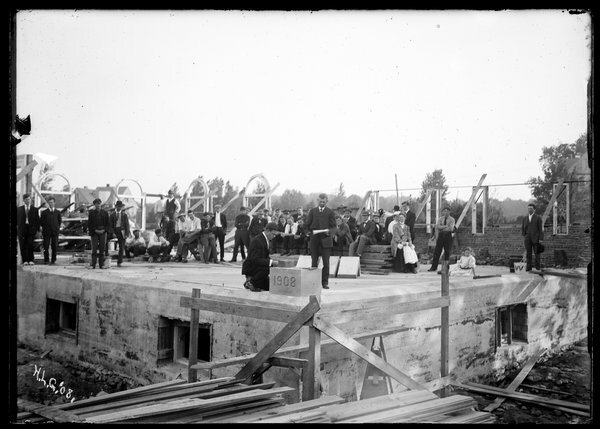 The other floors had dedicated areas for classroom instruction, laboratory work, and a large space for the Museum of Natural History. A greenhouse also sat next to the building. 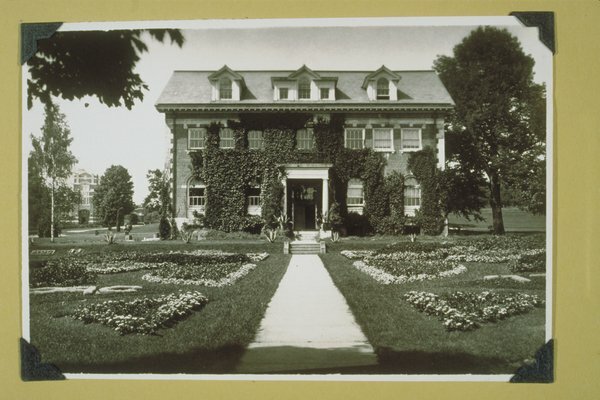 Horticulture Hall was renamed in February 1921 in honor of Alfred Gordon Gulley, a professor of horticulture at Connecticut Agricultural College from 1894 until his death on August 16, 1917. Professor Gulley was born in Dearborn, Michigan, in 1848. He received Bachelor and Masters of Science degrees from Michigan Agricultural College, where he worked for four years. After a year-long stint at the Vermont Experiment Station, he arrived in Storrs to work and teach. Gulley was described by one school administrator as “a lover fruits, flowers and trees.” He was reportedly a successful teacher and well-liked by his students. Others said he served the school loyally and even helped shape its appearance, managing the ornamental plantings around campus. He also helped promote Connecticut’s fruit growing interests and frequently appeared at meetings of state farmers. 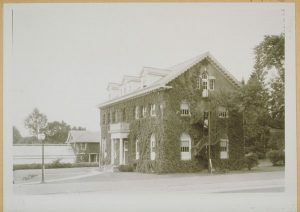 President Homer Babbidge moved into the Gulley Hall during his tenure (1962-1972), and the building has served administration purposes ever since. Today, Gulley Hall is probably best known as home to the offices of the University President and Provost. This entry was posted in UConn buildings, Uncategorized, University of Connecticut by Laura Smith. Bookmark the permalink.